Before I launch into my underlying agenda, let me vaguely introduce myself. I was born 3000 miles from here. Eighteen years later, I graduated from high school. Home is a small community — most of the friends I was graduating with had started at that same school with me when we were 5 years old. One of my best friends and I had our first playdate when we were 6 months old. In those eighteen years, I can’t remember ever needing to make new friends and I’d rarely had to say goodbye to any. However, a few months after graduation, it was time to pack up and move 700 miles away for university while most of my friends headed 3000 miles in the other direction. At the end of every ‘going away’ party that summer, the goodbyes were the same: “Don’t worry, we’ll stay in touch. We’ll Skype and WhatsApp. Plus, we’ll see each other again in a few months at Christmastime.” And, surprisingly, we kind of did. And at the end of Christmas break, we repeated the same promise to each other. It was so easy to stay in touch. With Skype and Whatsapp and eventually Snapchat, there was no excuse not to. It wasn’t until we got to that “we’ll see each other again in a few months” part that we hit a wall. It turns out that trying to catch up with everyone in your graduating class (okay, it was only 54 kids but still…) in two weeks is not easy. Not everyone was home at the same time and many people weren’t home for the break at all. Step 2: All 20 of those friends respond with when they’ll be home. Step 4: All 20 other people respond with what they’re going to bring. Step 5: Before you know it, the Facebook thread has taken a completely unrelated tangent and you’re arguing over whether seeing Magic Mike in theaters was worth it or not (for the record, definitely not worth it). So when you get back home on December 20th and want to know who you can catch up with, you’ve got to scroll through a hundreds of completely unrelated messages until you hopefully find the messages about when your friends are going to be home. And don’t get me started about the difficulty that arises when the 20 friends that the first person included in their message aren’t the 20 people that you care about. So then you start another Facebook thread with 20 different people and the next thing you know, you’ve got half a dozen of these Facebook threads with the information you care about hidden deep between posts about potlucks and Channing Tatum. Needless to say, somebody always got accidentally left off of an invite list because they responded with their travel dates at same same time they proclaimed that Matt Bomer was hotter than Channing Tatum and somehow the travel dates part of their message got overlooked. 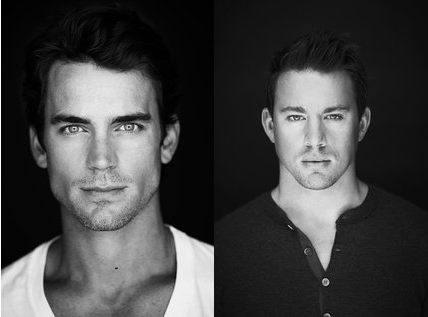 For reference, Bomer (left) and Tatum (right). You decide. After four years of that, I graduated from university with a job offer 2300 miles further away from home. Once again, I packed up and made a similar promise to my college friends. “Don’t worry, we’ll stay in touch. We’ll Skype and Whatsapp and Snapchat. And we’ll see each other… whenever it just so happens that we decide to use our limited vacation time to coincidentally travel to the same place at the same time.” And, unsurprisingly, we kind of didn’t. Sure, we Skyped and Whatsapped and Snapchatted, but I still haven’t seen many of them since graduation. I’ve traveled plenty since then — back home and back to my college town, for business and for leisure — but it’s so difficult to figure out everyone else who’s around at the same time that I am. Which brings me to today. I’m living 3000 miles away from my family, 6000 miles away from most of my childhood friends and 2300 miles away from my college friends. I still use Skype and Whatsapp and Snapchat, but now I have a new tool: n-Weave. With n-Weave, you just enter your travel dates and destination and it’ll show you which of your friends are going to be in the same place at the same time, whether they live there or just happen to be visiting. 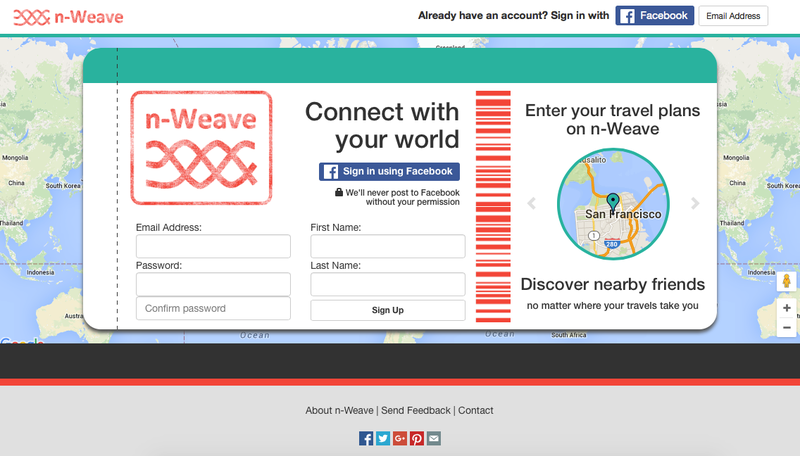 You can enter where you live and n-Weave will also let you know when your friends are coming to visit you. So even if you don’t travel much but you have friends who do, n-Weave can help you out. Step 1: Sign into www.n-Weave.com. Step 2: Click the New Trip button. Step 3: Enter my travel plans. So keep up your Skype calls, keep sending your Whatsapp messages and definitely don’t stop Snapchatting, but now you’ve got a tool to help you actually spend time with your friends and family — to help you actually connect with your world.